I love feet shots!! But I have to say, I strongly dislike the feel of stuck-on sand on my own feet. However, for whatever reason, it does make for happy kids, which makes for a happy YOU! Sand sure feels good between the toes! Love this picture! Thanks so much for your comments lately. I wanted to reply to you by email, but you don't have it set up for me to respond to through my email. Thanks so much for sharing your story. Like you the next week was one of the worst of my life. I found out I was pregnant again around the same time the due date was. That helped a little. It is still an experience that slaps me right back into reality. There has been so much to come from it. Congratulations on your kids! It sounds like they have a great mom!!! I just love this picture! 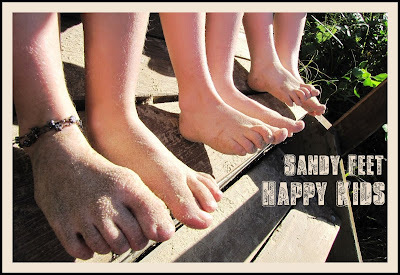 There's something so joyful about sandy toes!